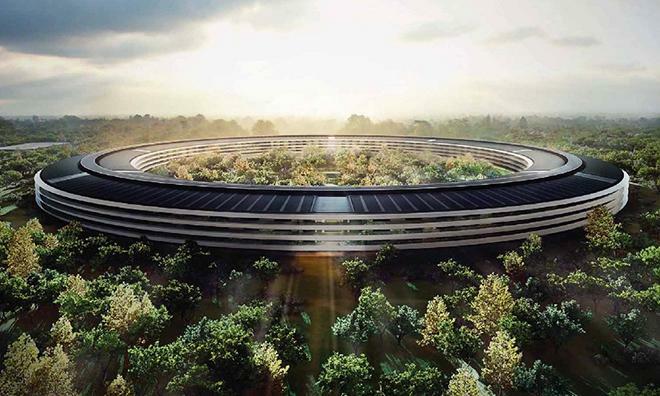 Also visible in and around the "Spaceship" Ring are concrete void slabs used to build an interlocking foundation and wall structure, which "serve as both the ceiling of one floor and support for the raised surface of the floor above," Apple has stated. The slabs are now building the first and second floors of the structure. Emphasizing the results of working with diverse, local suppliers, Apple details on its jobs website that the concrete void slabs for Campus 2 were sourced from the family-owned firm Clark Pacific. To build the slabs, Clark Pacific was said to have "developed a unique structural design to meet the demands of Apple Campus 2." Apple also says that Clark Pacific "now has four plants dedicated to producing products directly related to the [Campus 2] project," and has hired new workers to rapidly expand its operations. "The innovation and manufacturing that went into Apple Campus 2 have also enabled Clark Pacific to expand to other large-scale construction projects up and down the West Coast," Apple stated. 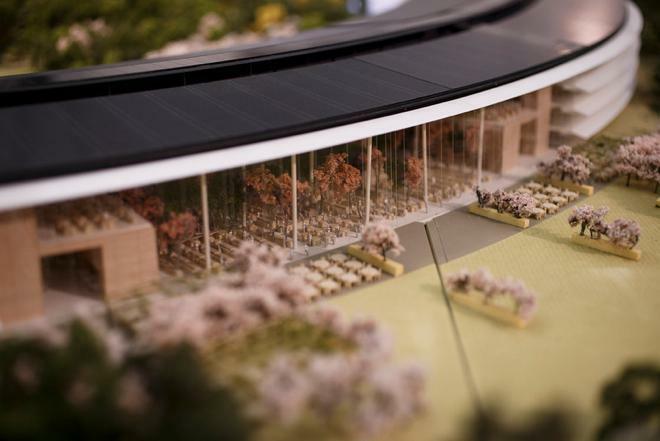 Apple's web site states, "We have approached this [Campus 2 construction] project with the same care and attention to detail we devote to designing any Apple product. We will replace 2.65 million square feet of environmentally and operationally obsolete buildings with a 2.8-million-square-foot iconic, 21st-century research and development campus." A previous tour of the Campus 2 construction site last week detailed progress from the southern side (below). 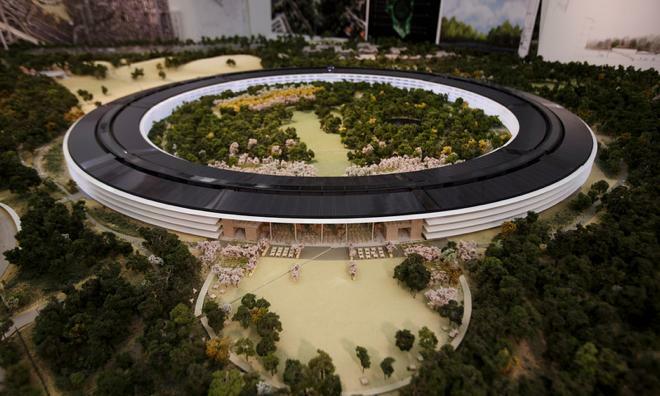 A model of the project (above), photographed by San Jose Mercury News depicts the initial steel structure as supporting an large open dining room area with ceilings tall enough to accommodate large trees, surrounded by a curtain of glass. Photo credit: Dai Sugano, Bay Area News Group. 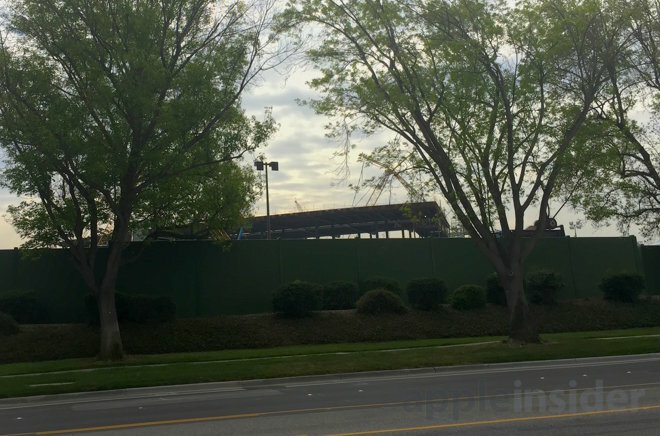 Granted final approval just a year and a half ago, Apple's Campus 2 project is rapidly moving toward its occupancy goal of 2016. See previous coverage on AppleInsider of Apple Campus 2 and the current Infinite Loop headquarters, or our other articles on drones. Viewers interested in the DJI Phantom 2 Vision+ drone can read more about the device or pick one up here. Update: Article was updated after publication to clarify that the visible steel structure supports a Campus 2 cafeteria and dining area, rather than simple entry. 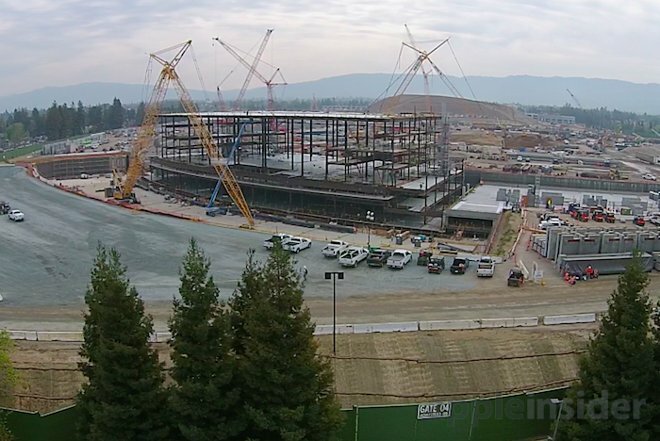 Note: Readers should be aware that Apple's Campus 2 site is extremely hazardous to photograph using an aerial drone, in part because the site is so large it is nearly impossible to fly over even one quarter of the site within constant visual or radio contact using consumer drone, and in part because the site is partially within an FAA restricted zone because of the nearby San Jose International Airport. There is constant low flying aircraft traffic over the site. We strongly encourage inexperienced aerial drone pilots not to attempt to fly in or around the site.